This compact reference contains the text of all Ohio Administrative Rules and Regulations from the Environmental Protection Agency. The index helps you quickly locate specific rules and regulations. 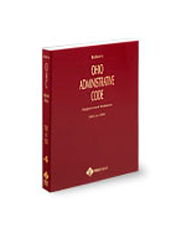 This book fulfills all the Revised Code requirements of an approved edition and provides the full text of, or reference to, each agency rule filed with the Legislative Service Commission.